India Meteorological Department (IMD), in its 1st stage Long Range Forecast (LRF) on Monday. The fifty-year (1951-2000) LPA for the Southwest (summer) monsoon rainfall is 89 cm. The monsoon is considered ‘normal’ when the June-September period has rainfall in the range of 96-104% of the LPA. The rainfall in the range of 90-96% of the LPA is considered ‘below normal’. Releasing the forecast, both the ministry of earth science secretary M Rajeevan and the IMD director general K J Ramesh said the prediction of ‘normal’ monsoon would be good for farm sector as the possibility of well distributed rainfall would help sowing of Kharif (summer) crops. Prediction on region-wise and month-wise distribution of rainfall will, however, be released in the IMD’s next forecast in first week of June. The forecast agency will come out with the prediction of onset date of monsoon by mid-May. The country had faced ‘below normal’ monsoon in 2018 and 2017. Though the IMD had predicted near normal rainfall (97% of the LPA with a model error of plus/minus 5%) for the year 2018, the rainfall actually turned out to be ‘below normal’ with nearly 91% of the LPA. According to IMD forecast, there is only 17% probability of drought (deficient monsoon) this year. It says there is 39% probability of near normal rainfall. As far as impact on farm output is concerned, the country has to suffer mainly in the drought year like what it had witnessed in 2014-15 and 2015-16. 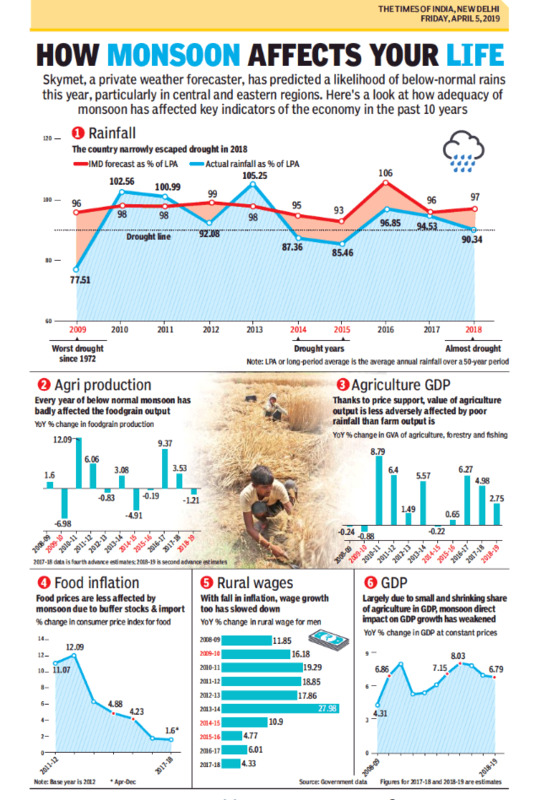 Both 2014-15 and 2015-16 – first two years of the Modi government – were drought years when an overall shortfalls of 10% or more of rainfall were recorded for the entire monsoon season. The country recovered it substantially the very next year in 2016-17 when it reported ‘normal’ monsoon rainfall and reached a figure of 275.11 million tonnes (MT) of foodgrain production. The output did not decline later when the country had faced ‘below normal’ rainfalls in 2017-18 and 2018-19 and recorded 284.83 MT and 281.37 MT of foodgrain production, respectively. Based on presence of El Niño phenomena, the private weather forecasting agency, Skymet Weather, had on April 3 predicted ‘below normal’ monsoon for 2019. It pegged the countrywide rainfall during the monsoon period (June-September) at 93% of the LPA. The El Niño is a phenomena where waters in the east and central Pacific Ocean warm beyond threshold levels, leading to changes in wind patterns that often weaken the Indian summer monsoon. Both K J Ramesh and M Rajeevan, however, on Monday said the El Niño was showing a wreaking trend – it means the monsoon may not face adverse impact of this phenomena during later part of the season. “Weak El Niño conditions are likely to prevail during monsoon season with reduced intensity in the later part of the season,” said the IMD.